I was brought up to believe that if something looks like a duck, walks like a duck and quacks like a duck... it’s a duck. In contrast, there’s a segment of the analogue synth community that would have you believe that it’s only a duck if it’s at least 35 years old. They’re wrong, of course, and now those nice people at Moog Music (who know the odd thing or two about ducks) are going to attempt to prove it to you. Leaks concerning the new duck, sorry, I mean the new Minimoog... reached the outside world on the setup day before this year’s Moogfest. The news spread rapidly and within hours it was as if someone had kicked a hornets’ nest of speculation, comment, learned pronouncements and criticism from many who were, in all likelihood, a few thousand miles away from any of the instruments and any of the facts. But at that point almost nobody outside of the factory had seen — let alone played — one of the new instruments, and what people actually wanted to know was, is this the rebirth of the world’s most iconic monosynth, or just a modern reinterpretation of a classic? To answer this, I placed one of the new Minimoogs (pre-production unit, serial number 0007, in case you’re interested) next to my original Minimoog (serial number 11235) and my immediate reaction was ‘bloody heck!’ (or, more accurately, an unprintable invitation to copulation) because it wasn’t obvious that the new one was not just a well-preserved original with a handful of well-installed modifications (see box). The attention to detail is astounding. It’s not just a question of the company sourcing or remanufacturing the right knobs and switches, using the right fonts and materials for the panel, or getting the shape and feel of the performance wheels right, it goes right down to minutiae such as positioning the screws in the right places, recreating the unnecessary but attractive cosmetic grooves in the woodwork and chamfering the base plate in the same way as the original. My eyes were telling me that I was simply standing in front of two Minimoogs, so this was a very good start. 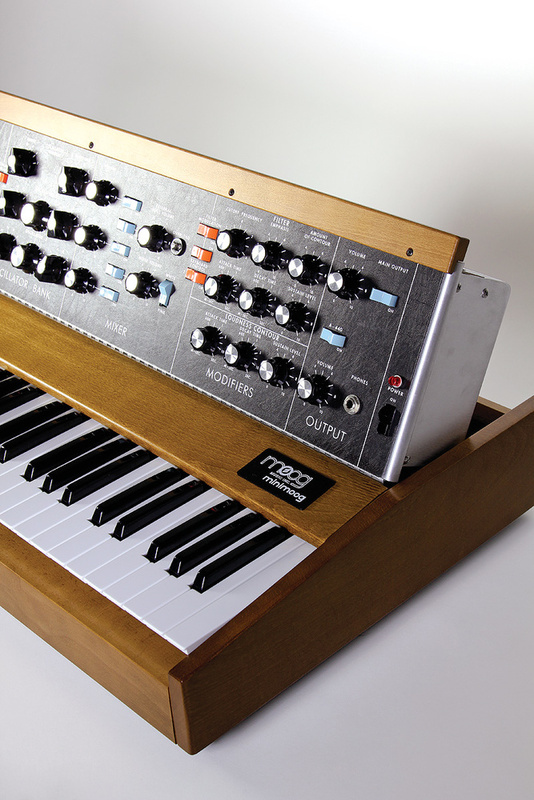 In principle, there’s nothing remarkable about the Minimoog’s three oscillators. Osc 1 and Osc 2 produce six waveforms — triangle, shark’s tooth, ramp, and three flavours of pulse — while Osc 3 offers the same set but with the shark’s tooth replaced by a sawtooth wave. All three offer six footages including a low-frequency option, with detuning of ±7 semitones on Osc 2 and Osc 3. Finally, you can detach Osc 3 from the keyboard so that you can use it as a modulator running at a constant frequency for vibrato and filter modulation. Moving on, the second pulse wave was also indistinguishable from my Minimoog’s, and the only waveform that was audibly different was the narrow pulse. In truth, I was amazed that I had gotten this far without hearing differences in timbre, since my Minimoog hasn’t been tuned, scaled or calibrated in the last three decades nor, in stark defiance of common wisdom, has it needed it. But the duty cycle of the third waveform on mine is not the same as that of the new model, so maybe I should look into this one of these days. Continuing the analysis, I obtained the same results when comparing oscillators 2 and 3; the first five waveforms were the same as my Minimoog’s, while the narrowest pulse had a slightly different timbre. So I decided to compare the outputs of the narrowest pulse waves generated by all six oscillators at my disposal, and found that they all differed from one another by tiny amounts. I should have guessed that this might be the case: this is an area in which the smallest variations in component values and calibration can have an audible effect, and I have no doubt that, if we wheeled in another few Minimoogs, all would differ to a degree. As Confucius (who was remarkably prescient) once said, “a life devoted to searching for two identical Minimoogs is a life wasted”. After all the hours of detailed analysis of the oscillators and comparisons between them, I found just two functional differences between the synths. Firstly, the detuning ranges of Osc 2 and Osc 3 are wider on the new model and, secondly, while neither synth approaches the 10s maximum glide time quoted in the specification, the maximum is a tad longer on my Minimoog. Neither of these is an issue. Rear panel of the Moog Minimoog Model D.
Like the oscillator section, the mixers on the two synths appear to be identical, with the standard five sources together with their dedicated on/off switches. However, the new model hides a modification here. In the past, many players connected the Minimoog’s unused audio output (either High or Low, as appropriate) to its external signal input, thus creating a feedback loop whose gain was affected by both the output volume and the external signal input volume. The results could range from nothing (the latter set to zero) through mild overdrive, to complete screaming, uncontrollable mayhem. To save you the cable, the new Minimoog contains an internal signal path that replicates this when nothing is inserted into the external signal input. Of course, you can still filter and shape signals from other sound sources but, like the original (and for obvious reasons), you can’t do this and generate overdrive simultaneously. While still in the Mixer section, I also compared the noise generators of the two synths. Spectrally, they are very similar in both their white and pink modes, although the level (at a given mixer setting) is lower on the new model. This could be a benefit; adding a tiny bit of chiff noise was always tricky on my Minimoogs, and having a bit more room for manoeuvre at low levels will be nice. Next we come to the fabled Moog 24dB/oct low-pass filter and, again, the two synths appear to be identical here. You have control over filter cutoff frequency, emphasis (which leads to filter oscillation when set close to maximum), and the amount of control exerted over the cutoff frequency by its dedicated ADS(D) contour generator. Three switches then allow cutoff frequency modulation and provide either 0 percent, or approximately 33, 67 or 100 percent tracking. I started my tests by checking the frequency responses of the two synths’ filters, and found that the new Minimoog has a slightly wider response than mine, but the difference is so small as to be immaterial in the real world. I also checked the tracking by making the filter oscillate and playing the keyboard, and was amazed to find that the tracking errors were identical to within 2 to 3 Hz across the whole keyboard. That was a remarkable result. The new Model D’s front panel is identical to the original’s except for the addition of the switches in the Controllers section. Nonetheless, the characteristic of the filter that (for me) defines the Minimoog is a quirk — probably serendipitous rather than a design decision — that causes the amount of emphasis to decrease with decreasing cutoff frequency. This is hugely important for some patches because dialling in emphasis (or resonance or ‘Q’) on many low-pass filters — including the Minimoog’s — attenuates the lower frequencies contained within the signal, and bass sounds can become undesirably thin and gutted. But, if the keyboard tracking is switched on, the Minimoog’s emphasis decreases as you play lower and lower, so you can have a resonant sound in the mid and upper registers that nonetheless retains all of its body and depth when you play low notes. So how did the two Minimoogs compare? I switched off the oscillators on both synths and caused the filter to oscillate by maximising the emphasis, switched on both Keyboard Control switches so that the filter tracked the keyboard 1:1, and then tuned the top A on the keyboard to A=440. Then I played. Initially, the results were disappointing; I could play downward on my Minimoog for fewer than 20 semitones (to around 150Hz) before the emphasis diminished to the point that the self-oscillation was gone but, on the new model, I could play down to the lowest note on the keyboard and the self-oscillation was still going strong at 50Hz and below. Consequently, when I created the same resonant bass patch on both synths, mine sounded deeper and richer. I was about to write to Moog about this when a thought occurred... Could it be that the maximum gain in the filter feedback loop that creates the resonance is different on the new model? I checked and, sure enough, my Minimoog’s filter started to oscillate when the emphasis knob was at a setting of 9 or thereabouts, whereas the new synth’s started to oscillate at around 8. So I backed off the emphasis on the new one and, at a setting of a little over 8, I could duplicate the response of my synth. I can’t tell you how relieved I was. The Minimoog is probably the world’s most iconic bass synth and, had I not been able to duplicate the filters’ responses, there would have been something horribly amiss. Next, I tested the filter’s dedicated ADS(D) contour generator and found that the famous, snappy Minimoog minimum attack time of around 1ms has been retained on the new model, with maximum attack and decay times of around 7s and 30s respectively. These compare with 9s and 30s on my Minimoog, which is fine. But much more important than differences in the contour times is the anomalous way in which both of the original Minimoog’s contour generators respond to rapid playing. When you play the first note in a passage, the voltage of the attack phase goes from zero to its peak in the time determined by the attack parameter. Later, provided that the Decay switch is On, the note enters a release stage when you release the note. But if you play a second note early in the release phase, the next attack peaks a little higher than the first, and the third is a little higher than that, and so on. The consequence of this is that, when played rapidly, many Minimoog patches become slightly brighter and louder than they remain when played more sedately. Many players seem unaware of this, but it can be a huge benefit because, to an extent, it imitates the way that players of acoustic instruments such as brass, woodwind and strings tend to play a bit louder and a bit more brightly when playing rapidly. So, does the new Minimoog exhibit this behaviour? I was delighted to find that it does, which is a testament to the accuracy with which the original has been recreated. Now we come to the area in which the new Minimoog differs most from the old: the modulation section. The original Minimoog had no dedicated LFO so, to obtain vibrato or wah, you had to place Oscillator 3 into its Lo mode, switch off its keyboard tracking, switch off its contribution to the audio signal path, and then route it through the Controllers section and the modulation wheel to either the pitches of Oscillators 1 and 2, or the filter cutoff frequency, or both. So, although the instrument had three oscillators and was often lauded for that reason, it only had two if you wanted to apply any form of cyclic modulation to the sound. Although you may missed the changes at first glance, a closer look reveals that the two quarter-inch sockets (Glide and Decay) next to the keyboard have been replaced by a knob that determines the frequency of the new, dedicated LFO, as well as whether it generates a triangle wave (when the knob is in its lower position) or a square wave (when pulled up). Furthermore, two extra switches have been added unobtrusively to the Controllers panel, and these now offer you a choice of five modulation sources rather than the two (Osc 3 and noise) of the original: Osc 3 or the filter contour when the modulation mix knob is turned fully anti-clockwise, or pink/red noise or the new LFO when the knob is turned fully clockwise, or any of the four possible mixes. Hang on a second... That’s just four sources. The fifth is any signal that you apply to the Modulation Src input on the rear panel which, when a cable is connected, replaces the noise. Interestingly, the noise signal can also be output from this input when you use a suitable cable, so you can simultaneously insert an external modulator and obtain a noise signal that you might choose to route elsewhere. But if you want the new Minimoog to respond in the same way as the old one, you just select Osc 3 and Noise as the modulation sources, and all is as it was in 1971. Elsewhere, the front of the new instrument is as before. The master tune control is still where it should be, as are the A=440 tuning oscillator, the master volume control, the main output on/off switch, and the headphones output together with its dedicated volume control. But when you look around the back, it’s clear that there’s more here than meets the eye. In particular, the new Minimoog now boasts CV outputs as well as inputs, with beguiling names such as pitch, velocity and aftertouch. So, perhaps we should next turn to the keyboard itself. One of the things that set the original Minimoog apart from its competition in the 1970s was its 44-note F-C keyboard. Unfortunately, this tended to deteriorate over the years, with the key levels becoming uneven, the throw of the keys increasing, and key clicking increasing as the rubber stops underneath the keys (the bushings) began to perish. All could be restored by replacing these bushings, which isn’t hard, but it’s a longwinded and fiddly job that few players attempted, so many vintage Minimoogs now have uneven, lifeless and often clattery keyboards with dirty contacts that don’t always play correctly. Fortunately, the keyboard on mine hasn’t deteriorated to this extent, but I can’t claim that it’s perfect and, if it has lain unused for a while, it takes a few widdly-widdly solos before every key will make proper contact again. 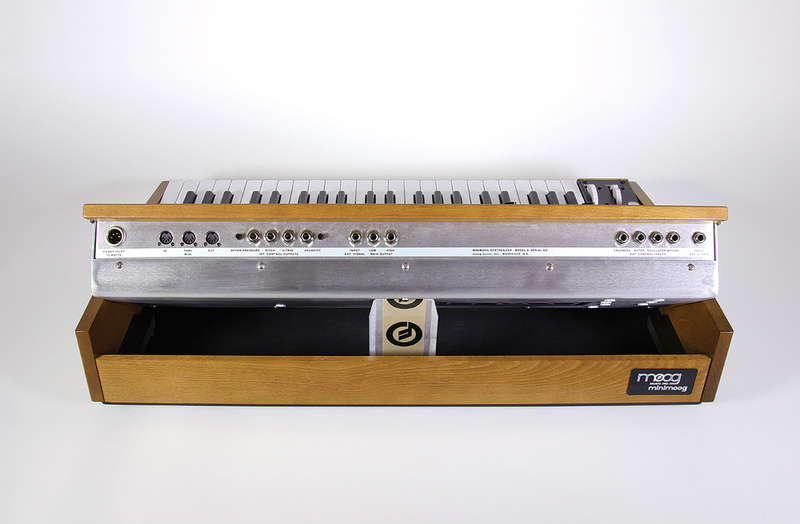 Comparing this to the Fatar keyboard in the new model (which is the same as was used in the Voyager) was interesting; the new Minimoog has a lighter action and a somewhat shorter throw (the distance from each key’s rest position to its maximum depression), and these can change the way in which the instrument responds when played quickly. After a while I noticed that I had begun to compensate for this by playing in a slightly more staccato style, thus allowing the voltage of the release stage more time to drop from the sustain level so, for the first hour or two, my fingertips were asking my brain whether they were playing a ‘real’ Minimoog. But, after that, all was fine. Spot the difference: The new Model D... ...and the original. The action isn’t the only thing that’s changed about the new Minimoog’s keyboard because it now generates velocity and aftertouch CVs. These aren’t connected internally so, unless you insert cables into the velocity and aftertouch outputs on the rear panel and route them somewhere sensible, nothing will happen. On the Minimoog itself, you can choose from the four CV inputs — loudness, brightness, pitch and modulation source — but you can’t apply aftertouch as a multiplying factor to the modulation amount provided by the mod wheel. This is such an important feature of pressure-sensitive synths that there had to be a reason for its omission, so again I posed the question to the chaps at Moog. “The mod wheel on the Minimoog is implemented as a shunt to ground, which means that it’s not voltage controllable,” Trent told me. “Changing this would have required a redesign of the entire modulation section, which would have introduced a series of other issues and artifacts requiring yet further redesign. So while this may at first seem like an omission, the decision was based on preserving the legacy circuits; we didn’t want to risk introducing subtle artifacts that could have compromised the Model D’s character and magic.” While I’m disappointed that pressure-sensitive modulation isn’t possible using the Minimoog in isolation, I applaud the decision. There must have been a great temptation to expand its facilities at the expense of authenticity but, for me, restraint was the better course of action. By this time, I was itching to stop analysing and begin playing the new Minimoog properly, so I created some of my favourite Minimoog patches on both synths and, with appropriate care, I was able to duplicate them on each to within a gnat’s wotsits of one another. This was when I uncovered another small difference between the two synths. On a vintage Minimoog, the bottom note outputs 0V, which means that switching on the keyboard control (tracking) switches has no effect on the filter cutoff frequency when playing this note. But the bottom note on a Minimoog is an F, which doesn’t conform to the modern V/Oct standard that decrees that 0V should be generated by a C, so Moog decided to make the bottom key of the new Minimoog output 0.5V. This means that, if you hook it up to another V/Oct synth, they’ll play in tune with one another, but is also means that switching on keyboard tracking when playing the bottom F causes the filter cutoff frequency to shift upwards by up to five semitones. To overcome this, Moog has added a Power On Command (see box) that allows you to determine which note will generate 0V, but this shifts the pitch CV throughout the whole of the instrument so, while it can recreate the historical filter response, it simultaneously causes the oscillators to detune by five semitones! That isn’t much use, and it’s much easier to leave the CV alone and set the cutoff frequency knob to a slightly different position if you’re going to recreate a patch with filter tracking on. Finally, it was now time to step far beyond the limitations of my Minimoog. To begin, I connected the new one’s velocity CV output to its loudness CV input, and its aftertouch CV output to its filter CV input, trimmed their responses using the small knobs alongside the outputs, and discovered what a delicious instrument a touch-sensitive Minimoog is. I also connected a selection of TRS expression pedals to the CV inputs, and found that I could control the pitch, loudness and filter cutoff frequency — and even create my own modulation signals — using these. I then hooked up my SH101 to the Minimoog’s pitch CV and V-Trig inputs and used the SH101’s arpeggiator and sequencer to drive the Minimoog. (I think that I lost a few hours of my life here!) Of course, the Minimoog doesn’t allow you to do things such as send a single output CV to multiple CV inputs without using an external multiple, nor can you receive multiple CVs at a single CV input without using an external CV mixer. So I placed it next to a small modular panel containing a selection of multiples, CV mixers, VCAs and an LFO, all of which allowed me to control the loudness and brightness using both velocity and aftertouch, simultaneously using aftertouch to add vibrato, tremolo and wah, and much more. I was straying perilously close to Moog Modular territory and, before I realised it, the sun was coming up. Sometime before the announcement at Moogfest, I had discussed the philosophy of re-releasing classic synths with the good people at Moog Music and I proffered the view that, in my ‘umble opinion guv, any recreation of the Minimoog should remain true to the original, and that they should resist the temptation to update it beyond a small handful of features necessary to ensure its relevance in the 21st Century. I’m therefore delighted to confirm that the extra facilities on the new Minimoog don’t detract from its identity in any way. Just set the modulation controllers to Osc 3 and Noise, and you have an almost precise recreation of the original synth. And, whether you use it to play a single bass note that rolls across the fens or a solo of such dazzling complexity that even Dream Theater would be embarrassed by it, the new Minimoog also sounds no more different from mine than any other would. In other words, it really IS a Minimoog. There will be the doubters, of course. There will also be those who, for whatever reason, think that it sounds clever to say that they ‘played a real Minimoog in a shop once, and the new one sounds nothing like it’. Ignore them, and remember the ducks. If it looks like a Minimoog, plays like a Minimoog and sounds like a Minimoog, it’s a Minimoog. Call me a Philistine if you wish but, were I given the choice between the new Minimoog with all of its extra facilities or a heavily used and potentially unreliable vintage instrument at the current hyper-inflated prices, I would have no hesitation whatsoever in choosing the former. Check out the SOS Tutorials video course on the Minimoog Model D.
I’m not a fan of external power supplies because their cables tend to be too flimsy and their connectors too unreliable for live use. 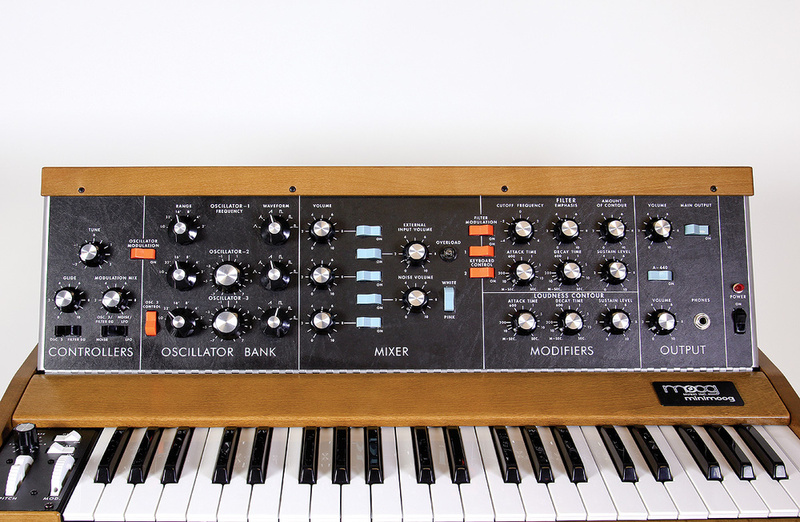 Consequently, it came as a disappointment to find that the new Minimoog has an external PSU, which Moog claim makes the instrument more stable (which I believe) and makes it easier for you “to travel with your Minimoog Model D” (which is rubbish). However, I was much happier when I saw that the connection between the mains and the PSU is a standard IEC cable and, rather than use the usual flimsy bell wire, barrel plug and socket, the connection between the PSU and the Minimoog is a robust cable terminating in a locking 4-pin XLR plug, which eliminates most of my objections. But you’ll have to be careful not to lose this power supply. It provides three rails at +15V, -15V, and +5V, and you’ll not be able to rush out and buy one in the local electrical store when you find that you’ve left yours at home on the day of the gig. I have just one criticism of the new Minimoog. Although MIDI is welcome, and you can even use the new Minimoog as a basic MIDI/CV converter, its implementation suffers from some significant omissions, most notably that neither MIDI modulation nor aftertouch are received at its MIDI In. The consequence of this is that you can’t sequence a performance with any expression other than velocity and pitch bend. For some people, this might render its MIDI capabilities almost pointless, so I asked Moog to explain. Trent told me, “If we had ported the design to SMT [surface mount technology], expanding the MIDI capabilities would have been a logical decision because it would already have been a redesign. In fact, we evaluated a number of possibilities — including this one — during the research phase, but in our view, these would have introduced a number of other issues that would have required even further redesign and, as you know, we were committed to not changing the sound engine. The MIDI implementation is quite minimal but this was deliberate, because any further implementation would have compromised the instrument.” It’s hard to argue with this reasoning. 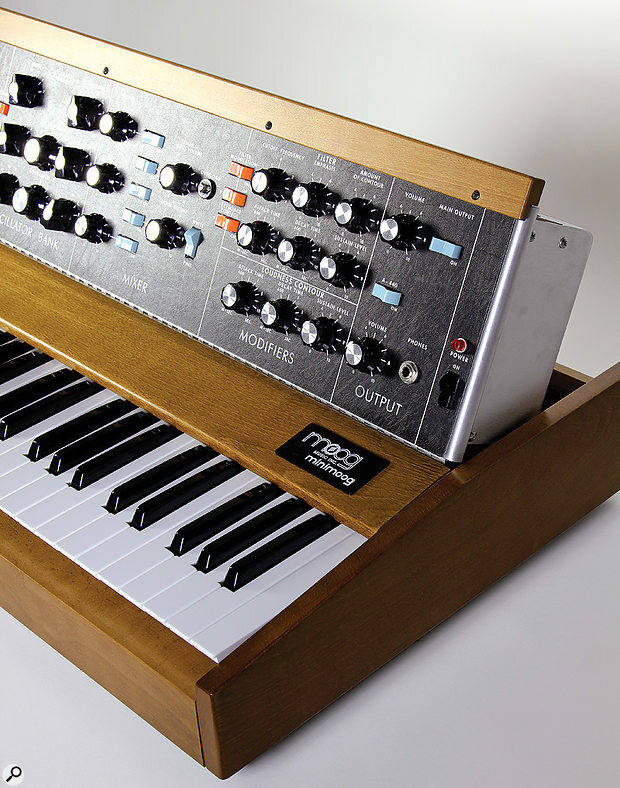 The new Minimoog offers a number of global functions that were, for obvious reasons, missing from the original. You choose between these one at a time by pressing different key combinations when switching on the instrument. So, if you want to change the MIDI channel and the key priority, you have to switch it on twice with different keys held. A reset function allows you to clear everything and start again if you get lost. These parameters will also be available via SysEx once the specification is finalised, together with the ability to create alternative tuning tables. Illuminated pitch-bend and modulation wheels. The MIDI implementation is not as comprehensive as you might wish. Don’t lose the PSU — it’s not a common AC/DC converter. It’s a Minimoog... a Minimoog with extras. Don’t be a numpty and claim that you tried one and it sounds nothing like the real thing. You might think you’ll sound knowledgeable, but you won’t, and you’ll be wrong. It’s a Minimoog with extras. What’s not to love? Moog Music +1 (828) 251 0090.